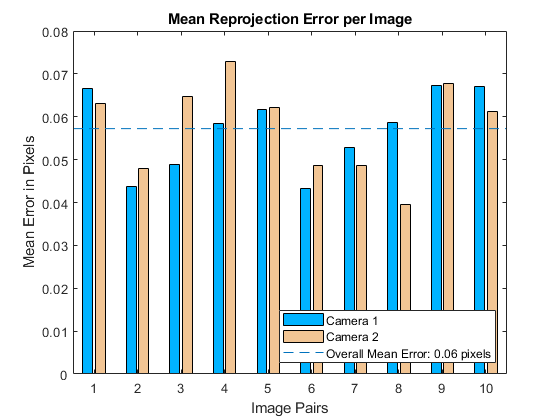 [cameraParams,imagesUsed,estimationErrors] = estimateCameraParameters(imagePoints,worldPoints) returns cameraParams, a cameraParameters object containing estimates for the intrinsic and extrinsic parameters and the distortion coefficients of a single camera. The function also returns the images you used to estimate the camera parameters and the standard estimation errors for the single camera calibration. [stereoParams,pairsUsed,estimationErrors] = estimateCameraParameters(imagePoints,worldPoints) returns stereoParams, a stereoParameters object containing the parameters of the stereo camera. The function also returns the images you used to estimate the stereo parameters and the standard estimation errors for the stereo camera calibration. cameraParams = estimateCameraParameters(___,Name,Value) configures the cameraParams object properties specified by one or more Name,Value pair arguments, using any of the preceding syntaxes. Unspecified properties have their default values. Create a set of calibration images. Generate the world coordinates of the corners of the squares. Plot detected and reprojected points. Specify the world coordinates of the checkerboard keypoints. Square size is in millimeters. Calibrate the stereo camera system. Both cameras have the same resolution. Key points of calibration pattern, specified as an array of [x,y] intrinsic image coordinates. Single Camera M-by-2-by-numImages array of [x,y] points. The number of images, numImages, must be greater than 2. The number of keypoint coordinates in each pattern, M, must be greater than 3. Stereo Camera M-by-2-by-numPairs-by-2 array of [x,y] points. numPairs is the number of stereo image pairs containing the calibration pattern. imagePoints(:,:,:,1) are the points from camera 1.
imagePoints(:,:,:,2) are the points from camera 2. Key points of calibration pattern in world coordinates, specified as an M-by-2 array of M number of [x,y] world coordinates. The pattern must be planar; therefore, z-coordinates are zero. Example: 'WorldUnits','mm' sets the world point units to millimeters. World points units, specified as the comma-separated pair consisting of 'WorldUnits' and a character vector representing units. Estimate skew, specified as the comma-separated pair consisting of 'EstimateSkew' and a logical scalar. When you set this property to true, the function estimates the image axes skew. When set to false, the image axes are exactly perpendicular and the function sets the skew to zero. Number of radial distortion coefficients to estimate, specified as the comma-separated pair consisting of 'NumRadialDistortionCoefficients' and the value 2 or 3. Radial distortion occurs when light rays bend more near the edges of a lens than they do at its optical center. The smaller the lens, the greater the distortion. Tangential distortion flag, specified as the comma-separated pair consisting of, 'EstimateTangentialDistortion' and a logical scalar. When you set this property to true, the function estimates the tangential distortion. When you set it to false, the tangential distortion is negligible. Initial guess for camera intrinsics, specified as the comma-separated pair consisting of 'InitialIntrinsicMatrix' and a 3-by-3 matrix. If you do not provide an initial value, the function computes the initial intrinsic matrix using linear least squares. Initial guess for radial distortion coefficients, specified as the comma-separated pair consisting of 'InitialRadialDistortion' and a 2- or 3-element vector. If you do not provide an initial value, the function uses 0 as the initial value for all the coefficients. Image size produced by camera, specified as the comma-separated pair consisting of 'ImageSize' and as 1-by-2 [mrows, ncols] vector. Camera parameters, returned as a cameraParameters object. Images you use to estimate camera parameters, returned as a P-by-1 logical array. P corresponds to the number of images. The array indicates which images you used to estimate the camera parameters. A logical true value in the array indicates which images you used to estimate the camera parameters. The function computes a homography between the world points and the points detected in each image. If the homography computation fails for an image, the function issues a warning. The points for that image are not used for estimating the camera parameters. The function also sets the corresponding element of imagesUsed to false. Standard errors of estimated parameters, returned as a cameraCalibrationErrors object or a stereoCalibrationErrors object. Camera parameters for stereo system, returned as a stereoParameters object. The object contains the intrinsic, extrinsic, and lens distortion parameters of the stereo camera system. 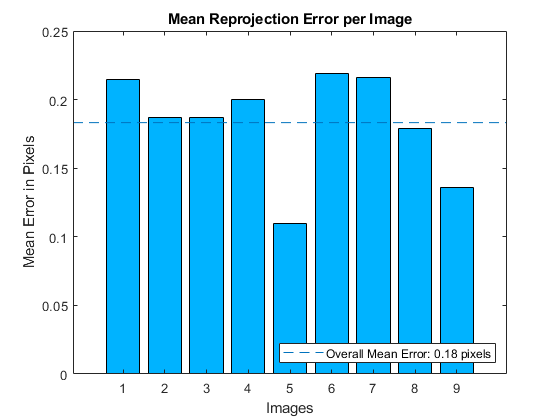 Image pairs used to estimate camera parameters, returned as a P-by-1 logical array. P corresponds to the number of image pairs. A logical true value in the array indicates which image pairs you used to estimate the camera parameters. Heikkila, J, and O. Silven. “A Four-step Camera Calibration Procedure with Implicit Image Correction”, IEEE International Conference on Computer Vision and Pattern Recognition, 1997. Bouguet, J.Y. 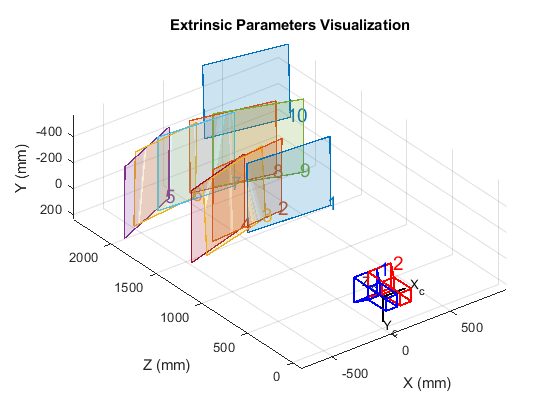 “Camera Calibration Toolbox for Matlab”, Computational Vision at the California Institute of Technology. 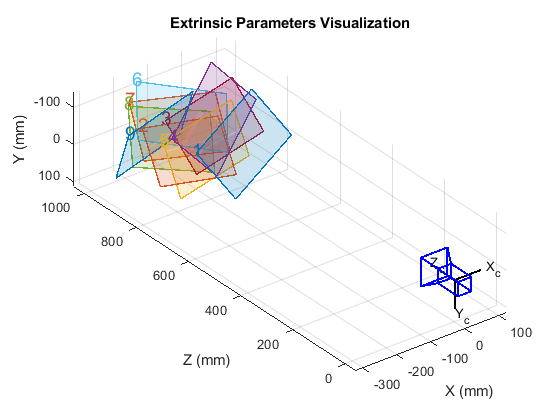 Camera Calibration Toolbox for MATLAB. Bradski, G., and A. Kaehler. 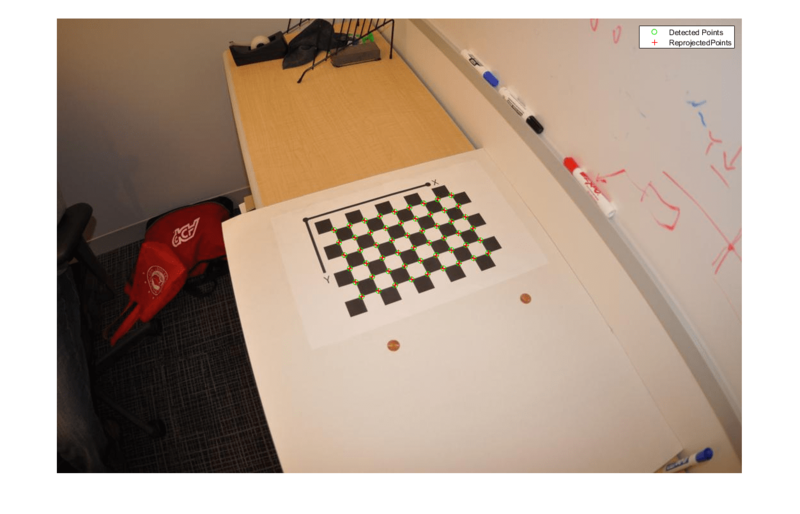 Learning OpenCV : Computer Vision with the OpenCV Library. Sebastopol, CA: O'Reilly, 2008.